Go here for more about St. Francis of Assisi. 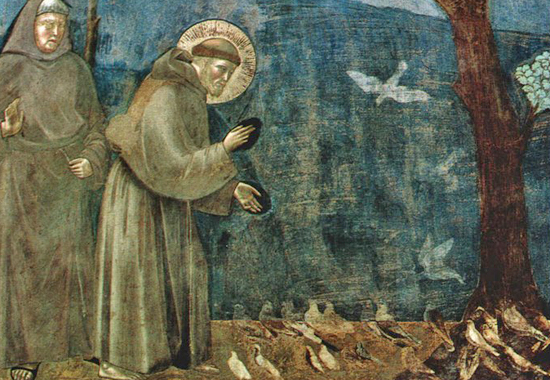 Go here for more about St Francis of Assisi's Sermon to the Birds. It follows the full text transcript of the Sermon to the Birds by St. Francis of Assisi. The sermon could have been delivered around the year 1220 near Bevagna, Italy. Ye owe much to God, your Creator, and ye ought to sing his praise at all times and in all places, because he has given you liberty to fly about into all places; and though ye neither spin nor sew, he has given you a twofold and a threefold clothing for yourselves and for your offspring. Two of all your species he sent into the Ark with Noah that you might not be lost to the world; besides which, he feeds you, though ye neither sow nor reap. He has given you fountains and rivers to quench your thirst, mountains and valleys in which to take refuge, and trees in which to build your nests; so that your Creator loves you much, having thus favored you with such bounties. Beware, my little sisters, of the sin of ingratitude, and study always to give praise to God.